They said it couldn’t be done. And in the end, it couldn’t. Coming back from 4 goals without even a single away goal to help was, in fact, insurmountable. But hat’s off to Arsenal for doing their damnedest to try it. An amazing first half display gave them the 3-0 win on this night, but unfortunately it wasn’t enough to overcome the 4-0 victory Milan took at the San Siro. And so while it seemed as if Milan were shocked by the scoreline and in awe of this team they had pummeled just 3 weeks earlier, they fought and survived to make it through to the Quarterfinals of the Champions League. Bravo. First, I would like to give kudos to the ref. Six cards was a lot of cards to give out, but he kept the match pretty clean, and called it really tight. He made a call in the 17th that many refs are afraid to make, but it was the right decision. He called van Persie for a challenge on Abbiati. The rule was made to protect goalkeepers, who get brutalized enough as it is, and are the stupidest/craziest people in the world. This ref got it spot on, well done. But I digress, I am avoiding the fact that Arsenal were freaking amazing the first 45 minutes. I’m sure it didn’t hurt that they live in the land of fabricated news and hyperbole, so that probably helped them to believe that they could do the impossible. 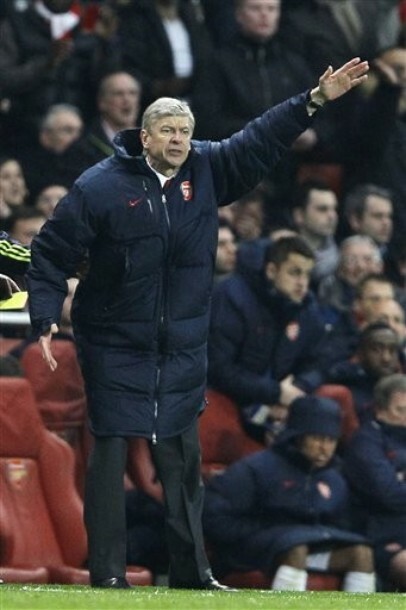 But hat’s off to Wenger, too. For the first time this year, we faced someone with similar injury woes, and they just rolled up their sleeves and worked that much harder. Bravo. Not so well done with that jacket. It's hard to take you seriously. 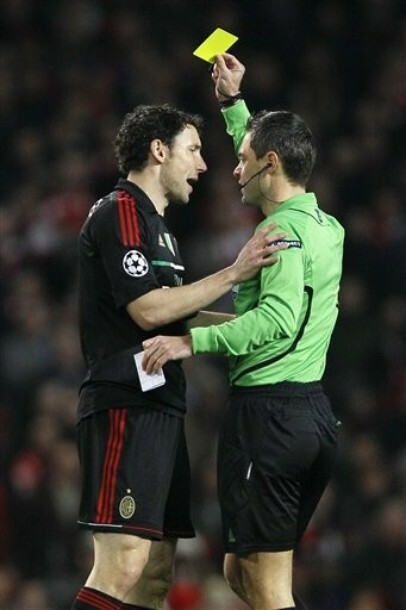 Van Bommel got the half started by earning a yellow card in the 5th, he will now miss the first match of the Quarterfinals. And he played much more timidly than usual for 85 minutes, but to his credit, he played quite well technically. The next minute saw Gervinho and Mesbah mixing it up in the box, and as I said, the ref was having none of it. He called them over to talk to them and to send a message, which seemed to have gotten across pretty well. Unfortunately, nothing could stop what was coming, when Koscielny scored in the 7th minute. 1-0 Arsenal. Shock. After that, the floodgates of hell opened. Arsenal were marking everyone so tight, I thought there were 20 of them on the pitch. And our defense had no clue that van Persie was slipping behind them all of the time, I thought I was having a heart attack. Ibra’s only forays forward earned him offside calls, I thought he was channeling Super Pippo. Not even Sagna’s yellow in the 13th, for a challenge on van Bommel, nor Gibbs’ yellow, for a challenge on El Shaarawy, could slow down the frenetic pace and determination of the Gunners. Well done, ref. Although he has seen one of those before. Abbiati had a save or two early on, including one in the 10th when Mesbah helped to clear it, but nothing could save it when our dear Silva failed to clear it in the 26th, allowing Rosicky to score. 2-0 Arsenal. Awe. Silva was perfect on the night outside of that, he cleared enough balls for 3 defenders. And it’s not as if we were just sitting around. In fact, in the 27th, both Ibra and El Shaarawy were whistled for offside simultaneously. Nothing was going right for Milan. Nocerino was playing really deep, but not really doing enough. Robinho was moving around, but seemed to be avoiding the ball, if that’s possible. Urby, who was visibly shaking at the beginning and also when he took a free kick, was clearly intimidated by the incredible atmosphere. Mesbah, having played with Lecce just 2 months ago, seemed to be a bit in over his head, too, but was still giving it a go, when he disastrously teamed up with Nocerino to give Oxlade-Chamberlain a penalty. It was clear that he exploited their naiveté, some might say it wasn't even a penalty, but what can you do? 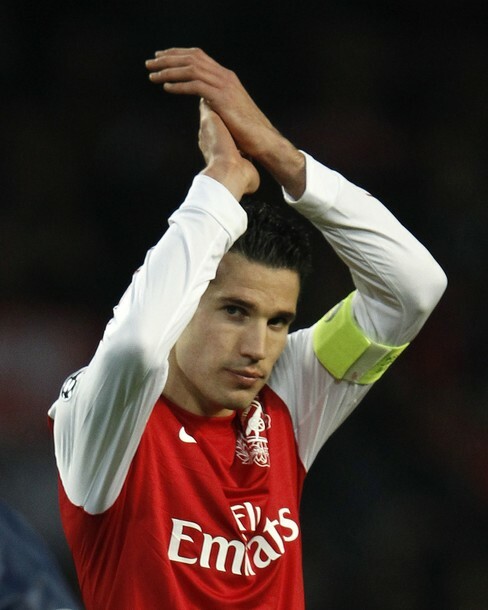 And so, in the 43rd, van Persie stepped up and scored. 3-0 Arsenal. Shock. El Shaarawy finally got the first decent shot of the night in the 1st minute of stoppage time, but he sent it wide in all of his fervor. And that's how to make a Panini Milanese, and get a penalty at the same time. Never have I been so excited for halftime. We all knew our boys could play better than this, but did they? And who better to remind them of it than the one that led them to Scudetto glory through an entire season last year? 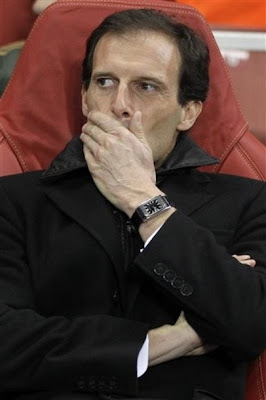 I may have my criticisms of Allegri, but this is certainly not one of them. I would have loved to have been a fly on the wall to hear what he said to them that incited the change in play from one half to the next. Awe. Arsenal may have spent too much energy in the first half, or they were in shock of this team that came out after the half, but Milan slowly righted the ship and regained more possession and were finally on attack again. Song earned his yellow in the 57th, he would have been suspended for the next match, too, had Arsenal gone on. Both keepers were duly tested. Czszesny came out in the 53rd one on one with Ibra and managed to get the ball in the nick of time, as Ibra never would have missed that one. Shock. Abbiati had a brilliant double-save in the 58th against not one, but two Arsenal players. Awe. Denying van Persie? All in a day's work. Mesbah, who had been a bit like a fawn finding his legs, now came forward and sent a shot in to Czszesny in the 61st. 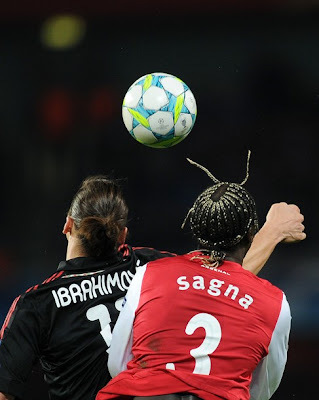 Then Ibra had a shot just wide on a poor clearance from Czszesny, and it seemed like Arsenal’s belief was fading as fast as time was running out. In the 70th, Allegri made an interesting swap of Aquilani for El Shaarawy, who had seen our best looks on goal. But at least it was good to see a bit of Aquilani again. In the 75th, Wenger finally pulled off Oxlade-Chamberlain, who seemed to have picked up a bit of a knock, for Chamakh. Just after this, in the 77th, Nocerino pulled a Robinho and missed what appeared to be a gift goal from point blank range. But at least he was involved in the play in the second half. Then Wenger brought Park on for Walcott in the 84th. Both Nocerino and Ibra received yellow cards, presumably for dissent, in the 86th. It looked like they wanted a possible handball call and did not get it, I’m not sure. But the scariest news of the match? Bonera on for Mesbah in the 90th minute. Why, Allegri, why? On so many levels. Sure, Mesbah was a bit shaky, it was his first CL match. But we could absolutely not afford to concede one more goal, so why Bonera? I will never understand that man’s substitutions. Still, it worked. With 55% possession and 13 goals, 5 on target, it could have been worse. Going into the match, I'd read that Arsenal were tied for the fewest shots, but had one of the highest accuracy rates. With 9 shots, an amazing 7 on goal, and 3 goals scored, you've got to give them credit for tonight. So we lost, 3-0. Ouch. Shock and awe, indeed. And yet, we won… qualification to the next round, by virtue our amazing performance at the San Siro. It’s hard to know how to feel. Having watched us completely freak out in the first half and cough up 3 goals, I was much happier when we simply failed to concede in the second half, although at least one goal would have eased my stomach. Still, we’re through!! The last time we did that was in…. 2007. But I won’t go there… yet. We’ve got a long road in front of us yet this season, let’s take it one game at a time. And again, kudos to Arsenal for an epic fight. Shock and awe. FYI, the draw for the Quarterfinals will be held Friday, March 16th. The matches themselves will be played the last week of March and the first week of April. Stay tuned next week! !